The term pareidolia describes a psychological phenomenon involving a vague and random stimulus(often an image or sound) being perceived as significant. We as humans have a tendency to see faces where there are none. It is thought that pareidolia is a side effect of the human brain needing to very quickly recognize certain objects as human faces or bodies. 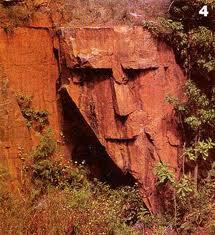 Pareidolia was once thought of as a symptom of psychosis. A good example is when psychologists and psychiatrists used inkblot tests where random splatters of ink suggest different images to different people. Some psychologist's used this test to examine a person's personality characteristics and emotional functioning. 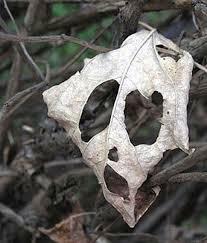 Pareidolia is now recognized as a normal human tendency that allows our mind to see things that we recognize easily. 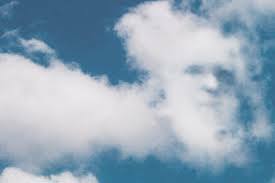 Common examples include seeing images of religious faces on objects and animals or faces in the clouds, the man in the moon, butterfly in an inkblot, faces in trees, leaves or rock formations. 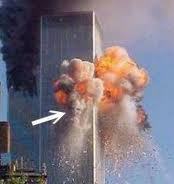 One form of pareidolia that really stands out for Americans is the supposed face of the devil in the fire at the twin towers on 9/11. Was there really a demon in the fire or our imaginations seeing this because of the evilness of this event and what could be more evil than the devil himself? ﻿Most cases of pareidola are caused by enlarging a picture until you see objects that look familiar. Most times the picture is enlarged to the point pixilation is evident. But since it is our mind’s natural tendency to see things we know and recognize some will still claim there is something paranormal there even when nothing but the pixels can be seen. These are not paranormal images even though we want to believe they are. It is nothing more than their imagination at work seeing things that are familiar to them. Excellent examples of this are pictures of forests, leaves, fields, mirrors or window glass that seem like they have paranormal activity happening but if you follow the branches of the tree and the leaves on them, shadows darkening or sun brightening the area, or with glass look to see if it is yours/someone else's reflection or objects in a room that can be seen through the glass of the window or light casting a shadow on the mirror most likely it is not paranormal at all. In these types of pictures, we will perceive them to contain faces, demons, and other things that are not really there. How often has one looked at a photo taken and get excited because it looks as though you've just captured a ghost in the picture but in actuality it was just from a shadow of an object cast on the wall or floor? Even if we look at something so simple as clothes in our closets our imaginations would let us see a face in the clothes just by the way they are meshed together. Sometimes we see what are minds imagine are faces in the clouds. What appears to be a face in the rock is nothing more than the side of a hill and the rock formation gives the illusion of a face. As paranormal investigators alot of pictures are taken that involves leafy areas. Sometimes in photo's it can look like a face but chances are it is simply just the elements of nature that have changed the appearance of the leaves. 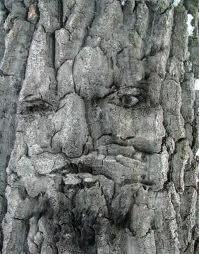 Clearly it would seem that there is a face with full features appearing on this tree. Our minds would see the eyes, nose, and mouth. But in reality it is nothing more than the way the bark has grown and formed that gives this illusion. As much as we would like to feel that we are so blessed as having Jesus appear to us, sometimes it just isn't so. 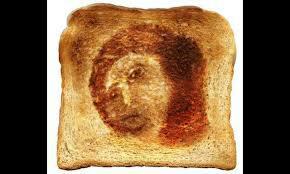 Sometimes it just the way the heating elements in our toasters heat some area's of the bread more than others. What some believe to be the image of the devil at the twin towers. Does our minds see this image because of the evil and devastation done to us on 9/11, that we associate the devil with the highest form of evil perpetrated against us on that fatefull day? An inkblot is an excellent example of Pareidolia because each individual can form their own image of what they see from one shape. 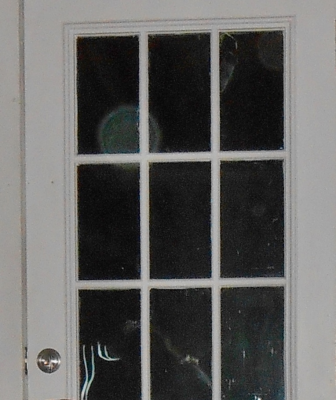 What looks like an alien looking in the door is nothing more than reflections of objects inside and maybe some dirt on the pane of glass.